1. Start with the most visible. Tackle stuff on counter tops or the floor, for example. Leave closets and drawers for later. You'll see obvious results from your decluttering efforts, which will make you feel more confident, energized, and inspired to continue. 2. Start with one thing that will make your life easier. Are you always searching for your keys? 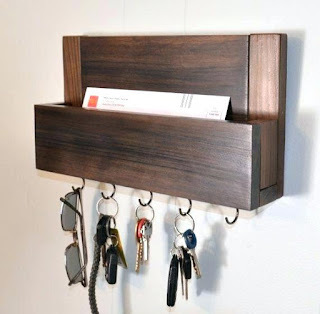 Put a hook for them near the door, or clear out your purse and designate one pocket for keys. Is the TV remote always buried? Declutter some throw pillows, clear out a drawer to give it a "home," or clear off the coffee table and place a basket for it there. Do coats, backpacks, and shoes always end up on the kitchen table or strewn across the floor? Declutter the front closet so there's plenty of room to hang coats, and put up some heavy-duty hooks for backpacks. Place a basket on the floor of the closet for outdoor shoes. Are your sink and counter always full of dirty dishes? Take three minutes each morning to empty the dishwasher, and help everyone start the habit of putting dirty dishes into it. Is there no room to put clean dishes away? Sort and declutter the 27 plates, 23 bowls, 18 mugs, 9 cooking pots, and piles of utensils. 3. Start with the biggest items. Do you need a couch and a love seat and three chairs? Can you mount the TV on the wall and remove the entertainment center? Do you need four bookcases? Declutter unloved books and trinkets, and maybe you can remove one or more. Do you need a hutch and a sideboard? Declutter unused china, linens, and miscellany at the back of the cupboard, and maybe you can delete one piece of furniture. Choose a drawer, a shelf in a closet or pantry, or the cupboard under a sink. Empty it completely. Sort stuff into three categories: keep, donate, or toss. 5. Do it all at once. Take the next several weekends, or a week's vacation, and declutter all at once. Work room by room or category by category. Stay hydrated. Take a short break every couple of hours to eat, read, stretch, or simply close your eyes. Stop each evening and do something fun and relaxing, such as going out for dinner or a movie, taking a bike ride, or having a soak in the tub and an early bedtime. 6. Do it little by little. Think you have no time to declutter? Do you have 10 minutes? 10 minutes a day times 7 days a week times 52 weeks equals 3,640 minutes. That's more than 60 hours. You can do a lot in 60 hours!